Azwell is a small unincorporated community in Okanogan County, Washington, United States. Azwell is named for its founder, Alfred Z. Wells (Alfred Z. Wells). Wells and his nephew Alfred Morris were owners of a hardware store in Wenatchee, and entered the orchard business in the area that would become Azwell. Their partnership was discontinued in 1941, Alfred Wells kept the orchard and Azwell became a company community with several year round residents. As of 1953, the town comprised about 300 acres of apple and peach orchards, a fruit packing warehouse, and a grocery store with a population of about 20 families living in Azwell year-round. Azwell is located at (47.94008, -119.88245). 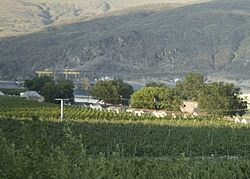 The community is located on the Columbia River, below Wells Dam. Azwell is 6 miles south of Pateros, Washington and 60 miles north of Wenatchee, Washington. Azwell, Washington Facts for Kids. Kiddle Encyclopedia.